She captured two catastrophes in one photo -- the apostrophes in parts and mussels. 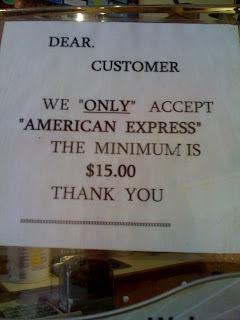 Plus, we have an example of unnecessary quotation marks in this sign. My research tells me that mussels can stay alive on ice for up to two weeks, so, assuming these creatures are fresh, they probably are actually alive. My friend Michelle sent me a photo of a sign from a bakery near where she lives. "They make best chocolate croissants in the universe," she says. "Their punctuation abilities are not quite as commendable." Besides the punctuation problems, this sign also implies that the bakery doesn't accept cash. Thanks, Michelle! 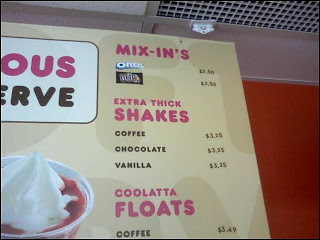 One of the most common errors I've noticed is the placement of an apostrophe before the "s" in a plural abbreviation. 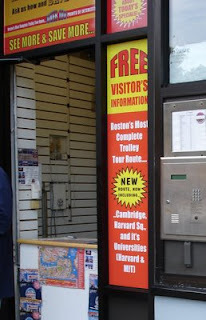 For instance, I recently saw a giant sidewalk sign advertising CD's. A reader named Dave sent me a screenshot from a large electronics store chain's web site that is filled with these kinds of errors. PC Richard & Son advertises flat panel HDTV's and projection TV's on its site. Even worse, they have a contest on their site involving the Yankees! 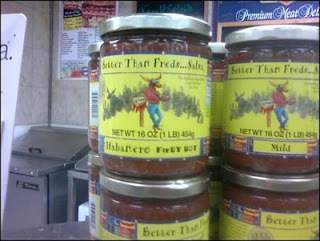 While I was waiting at the deli counter of my local FoodMaster, I noticed some jars of badly punctuated salsa. Trying to give Better Than Freds the benefit of the doubt, I went to its web site to investigate the missing apostrophe. Alas, the story of the company confirms that the name is referring to only one Fred. 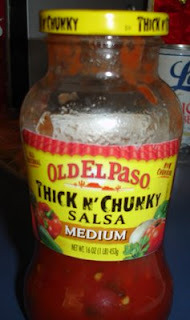 In search of catastrophe-free salsa, I headed down to Old El Paso. But Thick N' Chunky —- like the Cask 'n Flagon, Sweet 'N Low, and Guns N' Roses —- is missing an apostrophe, too. My quest for grammatically correct condiments continues. 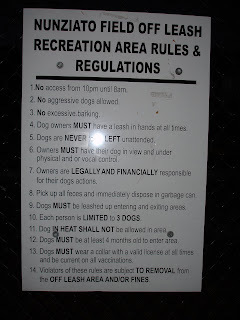 This sign, in front of a dog park in Somerville, lists 14 rules for conduct inside the park. Rule number 7 contains an apostrophe catastrophe (their dogs actions), but number 3 amuses me more because it seems to be addressed at the dogs. And if we want to be really picky, rule number 1 is missing a space after the period. We've got periods outside of quotation marks and parentheses, random ellipses, and, of course, unnecessary quotation marks. What kind of "tips" is the driver looking for exactly? It is Vegas after all. But I think the funniest part of the sign is the clip-art sun with the dollar signs in his eyes. I might have to make that my new avatar. "I haven't decided which part I'm more upset about," she writes, "the poor punctuation in the sign or the fact that I'd already taken off all of my clothes by the time I noticed it." I think I laughed more at the part in smaller letters, which is missing a period or an "and." It's as if they are saying, "Men will see you naked! We bet that will make your day!" 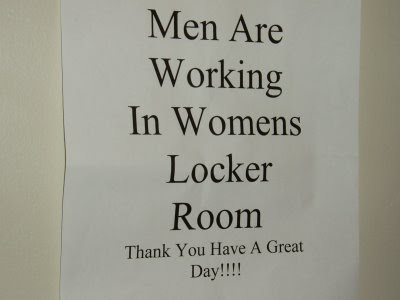 Mollie says her gym features several apostrophe catastrophes including a large sign advertising the BEGINNERS AREA. But it's only $19.99 a month, so she can't complain too much. An anonymous reader sent me a listing from the Yuba City Parks and Recreation Department. They have a cool-sounding program called Girls on the Run, but their brochure contains apostrophe catastrophes, referring to the courses as Girl's on the Run in large letters. This disturbs me almost as much as the fact that I now have a Wings song stuck in my head. The Downtown Crossing area of Boston provides a plethora of punctuation problems. 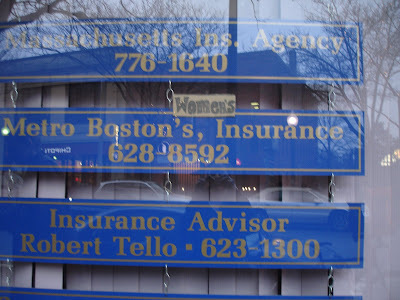 Besides these three postings, I noticed that a lot of stores don't seem to realize that the word men is plural. Mens is not a word. 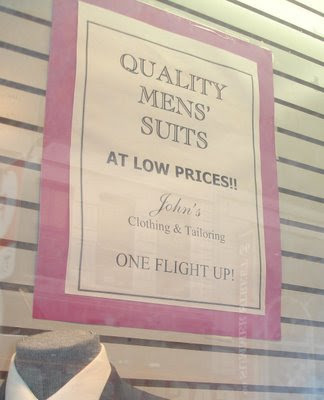 John's Clothing and Tailoring clearly think it is. 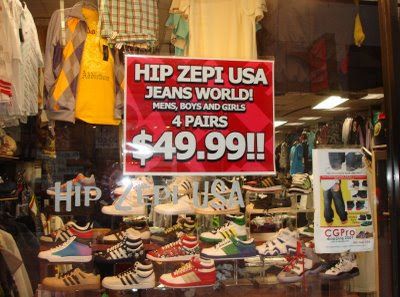 And this shop just omits all apostrophes, which makes it look like they are selling girls, boys, and, of course, mens. $49.99 for four pairs of men? What a bargain! Ben says he investigated and found out that the band uses proper punctuation in the song title; the mistake was on WFNX's end. If you look closely, you'll also see that WFNX wrote 80's instead of '80s. Good thing I'm going through a cheesy pop phase at the moment and haven't listened to much FNX recently. My musical taste is damaged, damaged, damaged. God, that song is so terrible. On the way to the beach (again) on Saturday, my friends and I were baffled by a generic ATM that said "ATMS CASH." The machine doesn't feature a punctuation error; it's just generally bizarre. 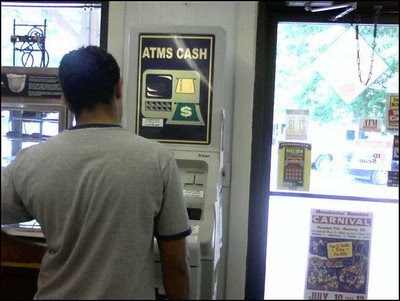 I guess the problem is that the "S" in "ATM" shouldn't be there. I wanted to take a picture of it without the random guy in it (sorry, random guy! ), but he was standing at the ATM for about five minutes, and I just couldn't wait any longer. He must have been confused by the sign, too. I stopped at Dunkin' Donuts on the way to the beach yesterday. 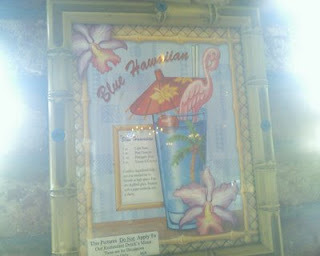 Standing at the sugar and Splenda table, my friend Stephanie noticed a sign promoting DD's new ice cream products. I was thrilled to discover that it contained an apostrophe catastrophe. 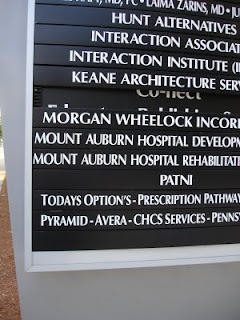 Mix-in's? Did I just use the word "thrilled" in reference to a punctuation error, you ask? Yes, I love it when national chains and other high profile companies screw up. And as much as I love Boston, I have no love for the ubiquitous pink and orange cups containing mediocre coffee. My friend Carrie went to Pennsylvania last weekend for a wedding and went to a restaurant recommended by some lovely Amish folks. 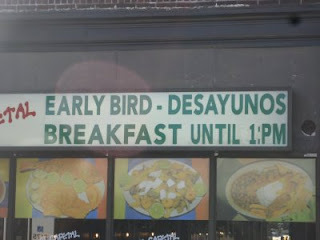 But the restaurant's sign was missing an apostrophe! 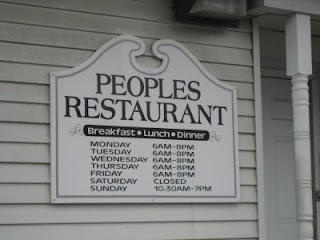 The even greater catastrophe was that the menu, which referred to the place as People's Restaurant, didn't offer breakfast on Sundays, despite what the poorly punctuated sign said. So most of her starving party was forced to eat gravy-drenched meals at 10:30 a.m.
Read more about the Amish adventure here. 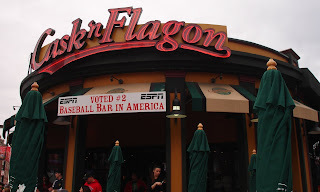 The Cask 'n Flagon has a banner under its sign declaring that it's the #2 Baseball Bar in America. Perhaps if it used apostrophes correctly, it would be #1. Like Sweet 'N Low and Guns N' Roses, its name is short one apostrophe. At least the name is consistent on the sign and on the Cask's web site. The only place the name is correctly punctuated is on ZAGAT.com. This doesn't surprise me since ZAGAT is classy like that. Impressive! This random colon was spotted in Brighton, MA. Thanks again, Merry!